Coba Ritsema -Jacoba Johanna Ritsema was 19th century portrait painter from the Northern Netherlands. 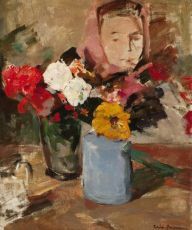 Jacoba, or Coba, was born in 1876 as the daughter of the book printer Coenraad Ritsema and his wife Jeanette (Jannetje) Moulijn in an artistic family with one sister and two brothers. In her family there were already a few known artists - her grandfather Jacob Ritsema was an amateur painter,... Read moreCoba Ritsema -Jacoba Johanna Ritsema was 19th century portrait painter from the Northern Netherlands.